Ben Lieberman is a Chappaqua dad like so many others in so many ways. But, he is unlike most in one heartbreakingly distinctive way–he had to bury one of his children. Seven years ago, the Lieberman family’s lives were forever changed by that phone call we all know as “a parent’s worst nightmare.” Their eldest, 19-year-old college freshman Evan, was being airlifted to the Level 1 regional trauma center of Westchester Medical Center (WMC) in critical condition due to injuries sustained in an automobile crash. Evan had been a passenger–a sleeping, rear-seat, belt-buckled passenger in an early morning car pool commute to a summer job. The Liebermans immediately rushed to WMC, took up bedside vigil and never left Evan’s side. They slept on air mattresses in the hospital waiting room, and prayed and willed their son to beat the 10% first night survival odds doctors gave him. And Evan responded, fighting long and hard for his life for a solid month. Ultimately, however, he lost his battle, and the Liebermans lost their son and brother. What do you do when you lose a child? Even in theory, it’s a question that is hard to think about; parents aren’t supposed to bury children, it just doesn’t make sense. 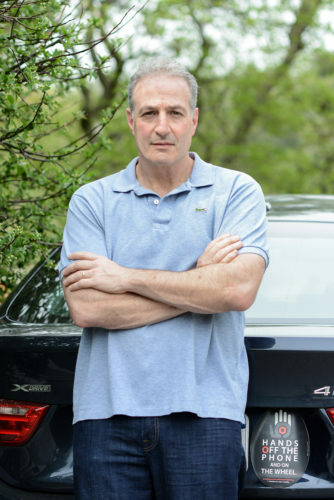 Eventually, through a civil suit, the Liebermans gained access to the driver’s cell phone records, and determined that the driver had been texting during the drive and near the collision, Lieberman relayed. The crash happened in a dead cell zone, Lieberman also noted, so it couldn’t be determined either way what the driver’s exact activity was when his car crossed the double yellow line. 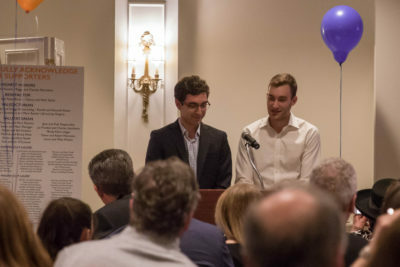 Ever since, and to honor Evan’s memory, the Liebermans have dedicated themselves to the dual causes of finding solutions for distracted driving and raising money for Westchester Medical Center. Combatting distracted driving has been a long, steady push to draw attention to the fact that distracted driving is as big an issue–if not bigger–than drunk driving. 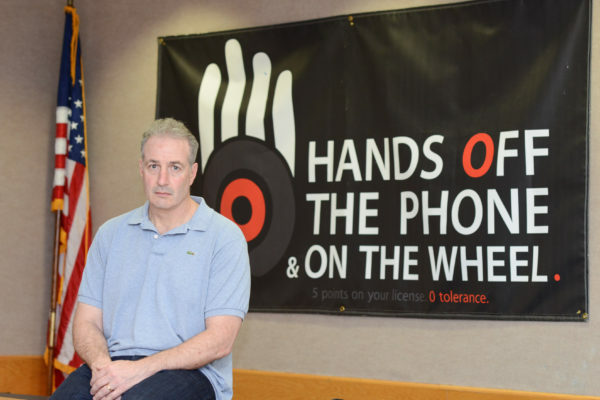 Lieberman partnered with New Castle Town Supervisor Rob Greenstein and Police Chief Charles Ferry to create the “Hands Off the Phone and On the Wheel” initiative. Signs, banners and freely distributed magnets featuring the stopped hand logo (which also signifies the 5-point violation) are visible throughout town. 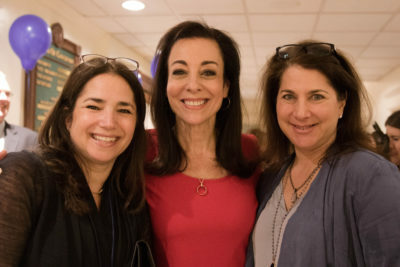 Lieberman also co-established Distracted Operators Risk Casualties, aka DORCS, –with the front passenger’s mother, Deborah Becker–to help spread the message far and wide that distracted driving causes terrible injuries and takes lives. And he began work with an Israeli phone forensic company, Cellebrite, to develop a device that would enable police to determine whether a driver’s cell phone was being used at the time of an accident. They called the device a Textalyzer for its similarity to the Breathalyzer. To counter the arguments from various civil liberties groups, Cellebrite even figured out a way to make sure the device simply determines data usage without accessing personal information. In 90 seconds, the technology generates a report that details illegal typing and swiping but also differentiates legal voice activation and Bluetooth. Lieberman, Greenstein and Ferry met with New York State Senator Terrence Murphy and Assembly Assistant Speaker Felix Ortiz to introduce the device, and to discuss a bipartisan state bill that would make New York the first state to attempt a distracted driving policy solution. Ortiz, who was instrumental in the 2001 legislation banning the use of handheld devices while driving, stated: “We did a good job in implementing hands-free law; unfortunately, at a crash, the law can’t be enforced without an eyewitness or unlikely confession.” The proposed Textalyzer bill, a solution aptly named “Evan’s Law,” would enable police to examine phones at an accident site using the Textalyzer. Governor Cuomo directed his Traffic Safety Committee to study the Textalyzer and the bill is pending. Meanwhile, interest continues to grow and spread nationally, and Lieberman, who testified in Chicago, California, Washington, D.C., was recently honored with the National Highway Traffic Safety Administration Lifesaver’s Award for Public Service at the 2018 Conference in San Antonio Texas. 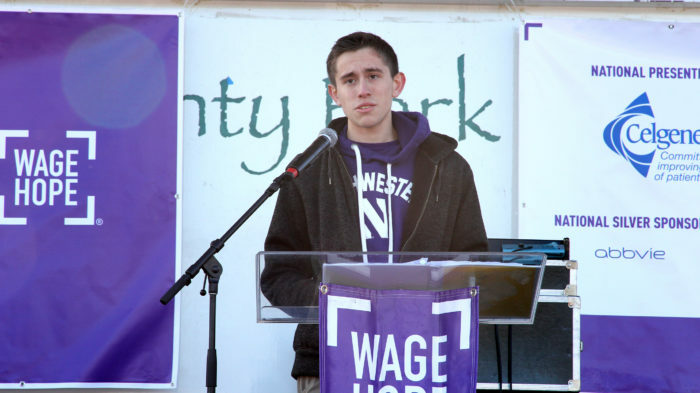 According to Lieberman, the fundraising started “almost by accident.” The Liebermans’ many friends all wanted to contribute something, to help in some way; many suggested various events and community gatherings that would keep Evan’s sports- and fun-loving spirit front and center while raising money in his memory. They started with mud-runs, poker nights, dodgeball games (one of Evan’s favorite activities). These events were a hit and filled a need. And, says Lieberman, “ended up raising real money.” Thus, Evan’s Team was established; its first project, renovating the waiting area of WMC. The family felt fortunate that Evan received excellent medical care, but they found the waiting room areas and experience were lacking in basic necessities. “There was nowhere to sleep, shower, or get a nutritious meal. There was no privacy; doctors and families were discussing the most intimate details of life and care without the dignity of private space.” With the generous funds donated by Evan’s Team, WMC’s Trauma Intensive Care Unit is now able to offer families “The Evan Lieberman Friends and Family Lounge”–a comfortable and dignified space complete with consultation rooms, private sleeping spaces, locker rooms with showers and an always-stocked nutrition center. Evan’s Team’s grass-roots outings have grown to become a well-sponsored and attended annual event. The local community continues to get involved, and friends who have since moved away return to reminisce and take part. It’s still “all about Evan and something he would have loved,” says Debbie. Golf, tennis, and, of course, Evan’s favorite dodgeball/funball make for a day of play, while the evening is capped by a dinner and much-anticipated car raffle. This year’s car is a 2018 blue Mercedes 4Matic, convertible with a sleek saddle interior. It’s a beauty! Parked at the top of King Street, in front of Quaker Hill Tavern, the car stands as an invitation to buy a raffle ticket (only 1,000 are sold each year), to join Evan’s Team and support such a worthy cause and to remember that driving is a privilege that requires attention, concentration and respect for the road and other drivers. Money raised from the event will go to Evan’s Team’s latest project–funding Maria Fareri Children’s Hospital’s Child Life and Creative Arts Therapies, dedicated to meeting the unique emotional, developmental and cultural needs of each child and family in their time of crisis. Perfect weather for a run! Come join runners from across the region for Answer to Cancer. and access to a block party at the end of the race. and then takes runners through the picturesque backdrop of the Bronx River trail. 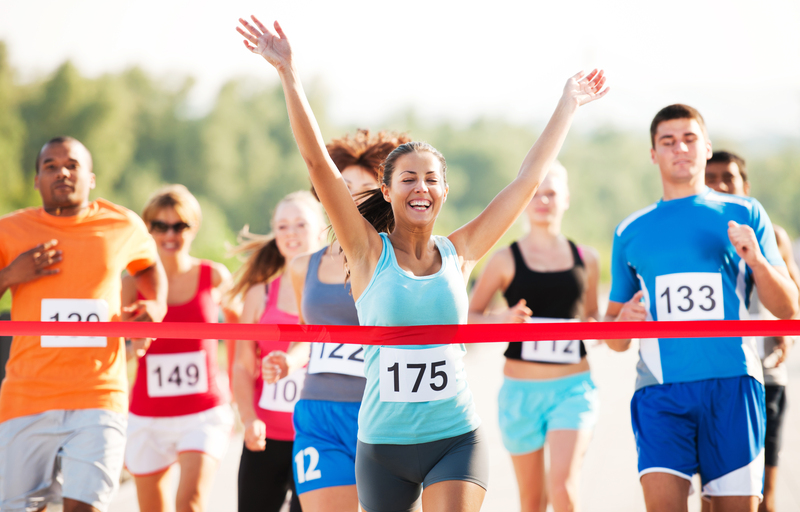 The course then winds back to the center of the city for a fun finish where runners will be greeted with post-race refreshments as well as fun activities for all ages! for what’s sure to be a memorable morning! 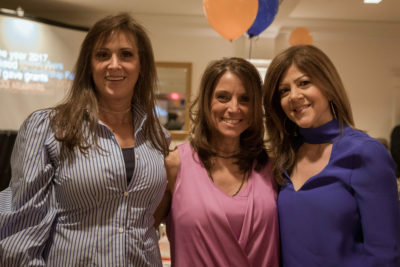 Proceeds will benefit White Plains Hospital’s Center for Cancer Care. I’M EIGHT, and standing by my bed is an actual grownup in iguana-themed pajamas: Aunt Jane. We spend the next 48 hours sugar-high and stoked on back-to-back “Star Wars” flicks. Jane’s officially the Pied Piper of my childhood. TEN. It’s my birthday, and Jane brings a record–old to her, new to me. She and my dad start singing, dancing, playing air guitar, pulling me in. The music swells like an ocean, its hypnotic waves–love, loss, freedom–all new to me. “Wait’ll you see Springsteen!” exults Jane (a Jersey girl). But I already know: I’m Born to Run. THIRTEEN. 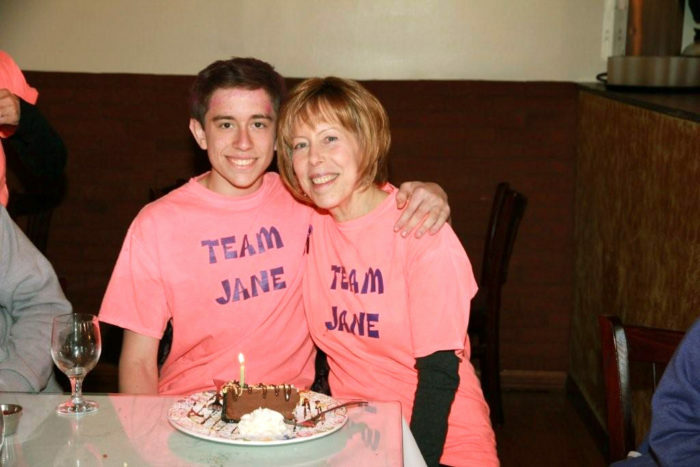 My Bar Mitzvah is eclipsed by shocking news: Jane has pancreatic cancer. I can’t even fathom what I’m Googling: a 7% survival rate?? Jane starts chemo; I start high school. Immersed in chemistry, biology, statistics, I find no antidote to fear. I do find PanCan (Pancreatic Cancer Action Network). Inspired by its motto—“Wage Hope!”—I launch a website that’ll tell Jane’s story while raising funds and awareness, team-jane.com. A bashful kid, I’m starting to…Run. Because maybe time’s not infinite after all. FOURTEEN. Team Jane flourishes online and off as I coordinate supporters for a 5K. Jane walks nervously alongside me, wearing a brilliant smile. We raise $3K, far exceeding our goal. Afterwards I phone her, bursting with plans for our next event. She’s weirdly subdued. “Wingman,” she confides, “it was the worst day of my life.” First I’m stunned, wounded. Then I realize I’ve been given a trust. My Pied Piper’s yanked me past childhood and into the abyss where only she and her tumor live. Her new nickname for me–“The Captain”–fuels my shaky-but-growing belief in myself. SIXTEEN. Brooklyn, Delaware, Chicago–at PanCan Walks nationwide, Dad and I represent Team Jane. Jane, despite cancer’s spread, keeps fighting. I keep coordinating, blogging, fundraising. I’ve raised nearly $150K, and with it, my confidence. I summer-intern at PanCan. It’s intimidating–lobbying on Capitol Hill, being interviewed on TV, addressing hundreds at 5Ks. 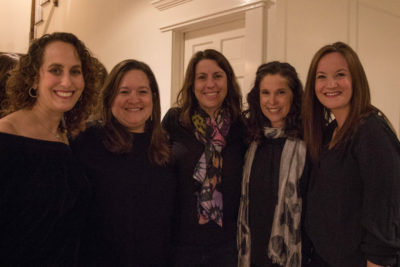 Most rewarding is creating “Voices of Hope,” a platform for teens to connect with survivors. Hope: it’s the only thing that quells the fear in kids like me, racing against time. Except…it’s not enough. On 9/24/16, I cling to the last remaining beeps of Jane’s monitor. The only other sound in her crowded-but-hushed hospital room: Bruce, serenading from somebody’s phone. She can’t speak anymore but recognizes me, still tries flashing that smile that launched a thousand crazy adventures. I can’t speak either, because there are no more words. Together we’d fought for life/love/family/all-day PJs/nonstop ice cream/Springsteen/a freaking CURE. SEVENTEEN. Heavy-hearted and lead-footed, I summon Jane’s mantra: “You must do the thing you think you cannot do.” I intern at another pancreatic cancer organization, CodePurple, where massive amounts of data are the chief weapons against this monster. 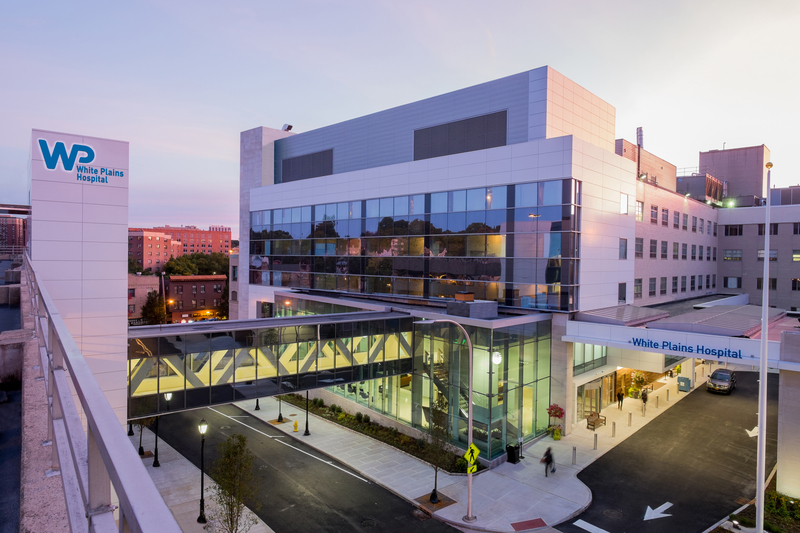 Travelling the Northeast, entrusted with a self-designed project, I interview leading clinicians and researchers. It’s illuminating. Progress, I’m learning, is fueled by passion and data, like life encompassing both sugar-highs and heartbreak. I grapple with paradoxes: Jane’s eternal childlike persona and her adult hell. And I resume Running–not “away” from anything, but towards everything. My momentum is now for the 65,000 Americans battling this cancer and the 50,000 who’ll be diagnosed next year. For Jane and all the others whose races have ended. And for my own self; for the ability to marry fear with hope, hardship with joy–to fill finite hours with infinite fun. Blessed with this rare gift, my aunt took on the world. Today, armed with a Häagen-Dazs pint and a playlist, I plan on doing the same. 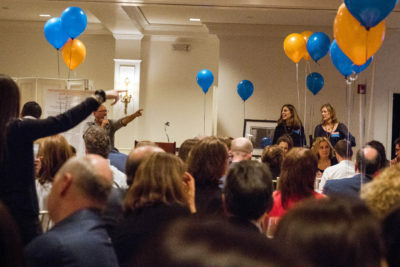 The Horace Greeley Scholarship Fund (HGSF) raised a record $186,000 during a March gala at the Mount Kisco Country Club. 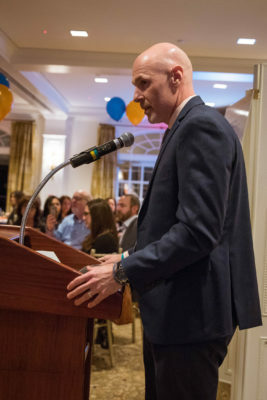 Brian O’Connor, a 5th grade teacher for the last 12 years at Seven Bridges, received the Ed Habermann Award. The HGSF lauded his interweaving of ‘CNN Heroes’ into his curriculum. His students have studied, connected with (sending out over 4,000 letters to dozens of heroes on five continents), and learned from these inspiring role models during dozens of Skype conversations and several Hero visits to Seven Bridges. Brian’s program was recognized and featured on the 10th Annual CNN Heroes Tribute live television broadcast in December 2016. 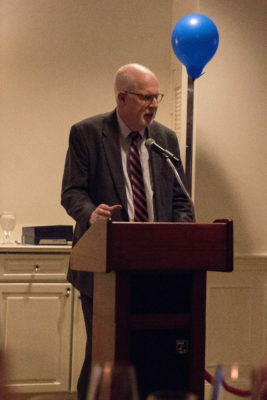 O’Connor’s dad, Jim, introduced his son, as “always a great leader, who led by example.” O’Connor, for his part, quipped, “I try not to screw them up in the ten months that I have them.” He described his goal of always working toward helping kids find their passion, “and see how they can use it to help other people.” O’Connor also enjoys time with his wife, Tara, and their three children–Alix, Jenna, and James. He loves coaching youth soccer, basketball, and baseball in their hometown of Montgomery, New York. 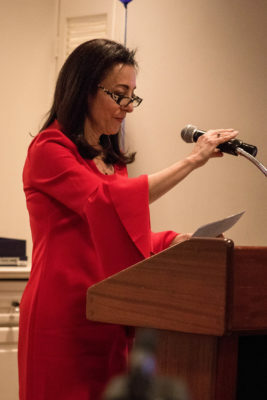 Ellen Miller, a passionate advocate of childhood nutrition, received the HGSF “Award of Distinction.” At Grafflin, Ellen chaired the Grapevine newsletter, Griffin magazine and the Health & Safety Committee. As part of a joint elementary school committee, she was a key architect of Grafflin’s “Eat a Rainbow” program which helped students select balanced lunches. She chaired Nutrition Committees at Grafflin, Bell, and Greeley. In 2006, Ellen joined the Superintendent’s Wellness Advisory Committee, helping to create the district’s wellness policy and food guidelines. She spearheaded the initiative to have recess before lunch, helped refine food service offerings and pricing, enhanced the district’s “farm to table” focus and established healthier food and beverage choices. 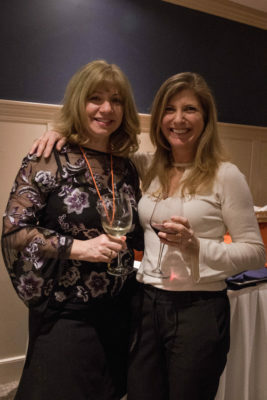 Ellenalso joined the Chappaqua School Foundation board in 2006. She worked on the Grants Committee for the majority of her nine-year tenure. Ellen Miller’s two sons Harris and Trevor poked fun at their mom’s limits on both junk food and her allowance of twice a week red meat dinners. They said they admired her for ‘burning the candle on both ends” as she worked toward a Master’s degree in Food Studies at NYU.